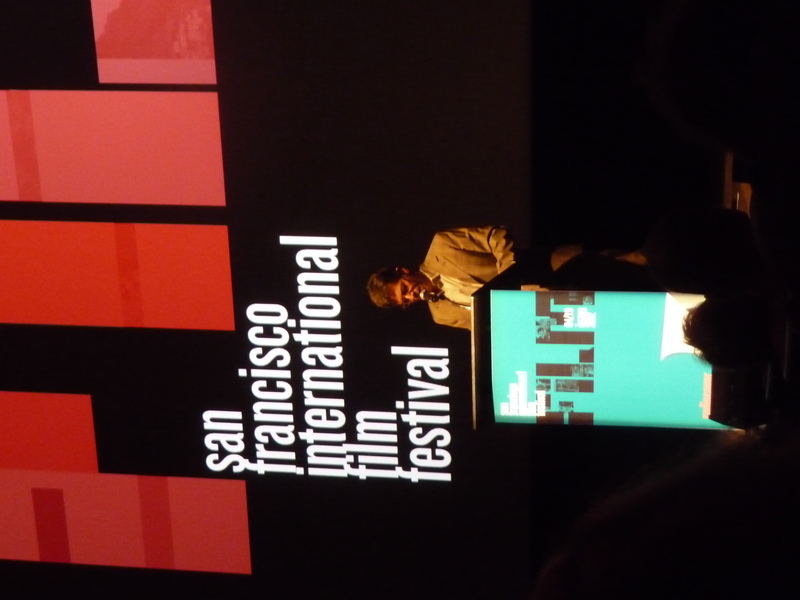 Kicking off the first weekend of the San Francisco International Film Festival was the erudite and engaging Jonathan Lethem, speaking on the State of the Cinema. Looking every bit the professor/novelist/general intellectual-about-town, he delivered a thoughtful, passionate, witty and poetic address. I will not attempt to summarize it here, as it was complex and full of inter-related diversions and words I had to look up later in the dictionary. However, I came away with the following: the state of cinema is not a fixed point in a time period or in history; it is not a clash against the new media; and it is not a purely reactive medium. One state of cinema is that nascent state which speaks to the “invisible frameworks of desire and frustration.” One cinematic subject is us and our desire to have something happen. With cinema we can simply desire and not demand, ask and not be fulfilled. This state of indeterminacy should be nourished and valued (to that end, I would add that art should never quench our desires). There is a state of cinema which is unfinished and non-commodifiable, a state in which a filmmaker is allowed to “articulate the terms of the difficulty” and not resolve it. And finally, the state of cinema is timeless – just because the art form has achieved a certain historical depth doesn’t mean it is about to reach its apex or its end. Cinema may not have arrived yet. Like Christine Vachon, last year’s State of the Cinema speaker, Mr. Lethem argues persuasively that the perceived clash between the new and the old media is overrated. As Ms. Vachon sees new media as a way to support increased distribution of old media, he likewise sees new media as a way to re-energize old media, and vice-versa. The aesthetics of concurrent media can inform, engage, and transform each other. After all – we are together in the business, either as producers or consumers, of continuing the tradition of narrative, and to support a network of frameworks is highly beneficial. Mr. Lethem’s speech, moreover, reminded me of the importance of sustaining the dialogue between cinema and other forms of narrative (in his case, the novel and the essay). I don’t know whether he realized, during his talk, that he himself is a good example of the way he describes concurrent media engaging with each other. The experience of watching and the exposure to various cinematic conventions clearly inspire him as a writer and sustain his faith in the state of the cinema.